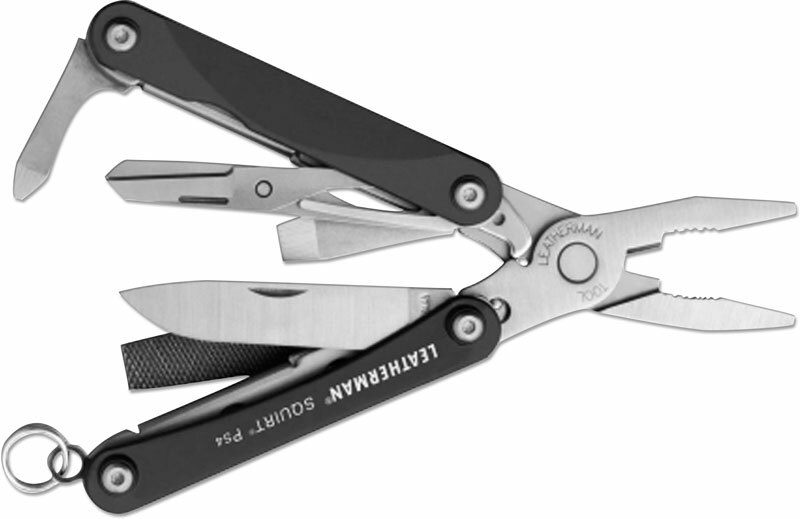 The illustrated Leatherman Tool is the Leatherman Squirt PS4 Tool that features spring action needlenose pliers, regular pliers and wire cutters. This Leatherman Tool has a stainless steel body with black anodized aluminum scales, 2.25" closed, a 420HC stainless steel drop point blade, spring action scissors, wood/metal file, medium screwdriver, flat/Phillips screwdriver, bottle opener and a key ring attachment. The Leatherman Squirt PS4 Tool with black handle scales weighs 1.9 ounces.